Hotel W Barcelona, Barcelona, Spain - Lowest Rate Guaranteed! With a stay at W Barcelona in Barcelona (Barceloneta), you'll be a 1-minute drive from Barceloneta Beach and 8 minutes from Port Vell. 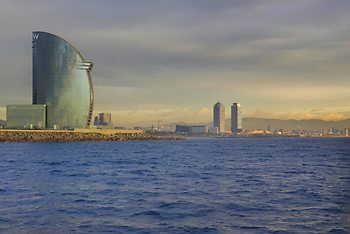 This 5-star hotel is 1.5 mi (2.4 km) from Barcelona Aquarium and 1.6 mi (2.5 km) from Picasso Museum. Brilliant Hotel! New, spacious, great location, well lit rooms and staff is extremely friendly! Pool service is pretty chaotic, food orders took too long to be delivered. The bills often had to be checked again as food/drinks were charged twice or bills from other guests were charged on the wrong bill.